The succulent combination of the lamb and the ratatouille makes it very mouthwatering menu addition. 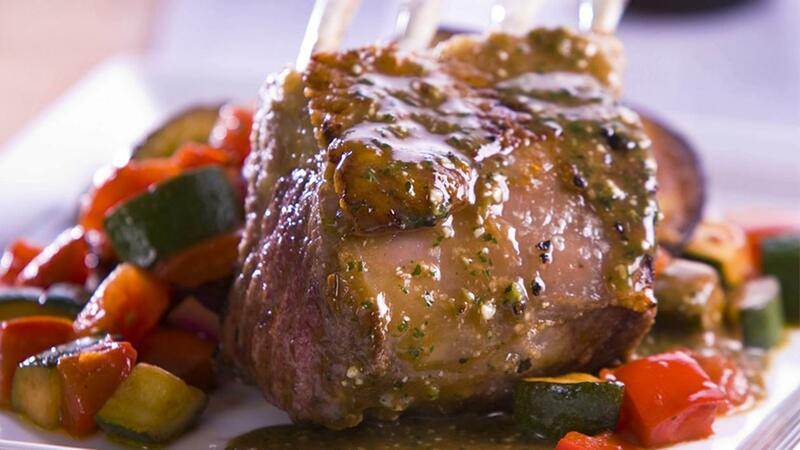 Clean and trim the lamb rack to remove excess fat and season with the KNORR Aromat. Pre heat the oil in a large pan and seal off the racks until golden brown remove and finish cooking in a preheated oven (180 degree Celsius) until med rare, remove, keep hot and allow to rest, this will finish the cooking. Fine chop the garlic, dice the onion, eggplant, capsicum, tomato and zucchini. Preheat some oil in a large pot and lightly cook the diced vegetables until golden and soft, remove from the heat and keep hot. Place the pine nuts and whole unpeeled garlic cloves onto a baking tray and cook until golden brown in a preheated oven (180 degree Celsius), remove and allow to cool. Wash and pick the mint and blend in a robo coupe with the cooked pine nuts, squeezed out cooked garlic cloves and olive oil until it forms a paste. Place the hot water into a large pot and whisk in the KNORR Demi Glace, bring to the boil while stirring continuously, reduce heat and simmer for 2 minutes, stir in the mint pesto just before serving. To serve, place the ratatouille onto a large plate with the cooked lamb and add the mint pesto sauce.